The 2006 Spring Awakening is surely one of the oddest triumphs in musical-theatre history. Steven Sater’s book is a faithful rendering of the great (and still shocking) tragedy by the expressionist playwright Frank Wedekind – which had received its first performance exactly a century earlier – about the oppression of adolescents in turn-of-the-century Germany by a tyrannical educational system and parents whose treatment of their children falls along the spectrum from conformist terror and cowardice to insensitivity to downright cruelty. But the score, with lyrics by Sater and infectious music by Duncan Sheik, is contemporary. The combination feels like it shouldn’t work but it does: the musical numbers both comment on Wedekind’s text and place its depiction of teenage angst on a continuum that crosses into the twenty-first century. No one who has read about the epidemic of high-school suicides in Palo Alto over the past several year needs to be convinced of the relevance of Moritz Stiefel’s fate in the second act of Spring Awakening – because, befogged by the behavior of his hormones, he can’t concentrate on his overwhelming load of schoolwork and feels his weak academic performance has wrecked his life irrevocably. The songs in the musical electrify the anguished, overwrought responses of the young characters, as well as their confused, usually botched efforts at sexual experimentation. So much is going on in Arden’s joyously eclectic staging that sometimes it seems like a three-ring circus, but its chaotic feel actually derives from both a fine eye and a carefully disciplined approach. The production lacks the polish of the original Broadway version, but polish isn’t what Arden and his collaborators are after. They’re after visceral excitement and emotional power, and they get both. The show is full of memorable moments and images. In the first scene between Melchior and Wendla, actors form a pyramid behind them to suggest a waterfall. During a tender gay love scene, the “voice” (Daniel David Stewart) of Ernest (Joshua Castille), at the piano, spins around on his stool when Hanschen (Andy Mientus) kisses his counterpart, blissed out. (This is the only scene from the 1906 play that required tonal refitting: Wedekind portrays homosexuality as a twisted consequence of sexual repression.) In the graveyard scene at the end of the second act, chairs rise out of the orchestra pit for the dead – a nod, of course, to Our Town; earlier the ensemble stand in as trees in the forest, an idea Arden borrowed from a later expressionist classic, Dürrenmatt’s The Visit. 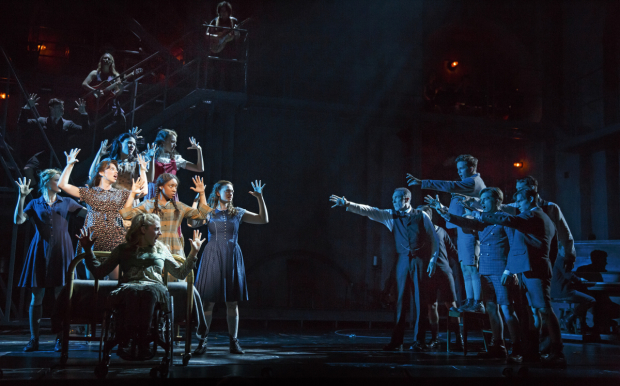 The interaction between the hearing and deaf actors is inventive and often witty, as when Melchior rolls a smoke for Moritz, and Durant passes the cigarette to his “voice” – Alex Boniello, a guitar-playing rocker in a black leather jacket with a modified Mohawk – for a couple of puffs. Moritz gets the gun he uses to off himself from his “voice,” just as Wendla’s (I saw Lizzy Cuesta, subbing for Katie Boeck) hands her the switch she get Melchior to beat her with, in one of the most unsettling scenes in the play. There are only a few moments when we hear the deaf actors’ own strained voices, and they are very affecting. In one, Moritz, signing, asks his father (Harvard), tentatively, what would happen if he failed the year and Herr Stiefel, seeing through his ruse to the truth (that he’s already failed), breaks through the silence and his hoarse cry of dismay is horrifying. Harvard is very fine, but the musical hasn’t solved the problem of the caricatured schoolteachers, and though Page is a good actor, he can’t surmount it. At least he seems to be trying; Greene doesn’t fight the broad exaggerations in her roles. Wedekind was working with the kind of expressionistic satirical approach here that many subsequent German artists made their trademark (like, most famously, the painter Georg Grosz), but in a twenty-first-century context it may strike us as over the top. Except for Greene and, unfortunately, Austin P. McKenzie as rather a one-note Melchior, the cast is strong. Apart from Durant and Frank I’d single out Treshelle Edmond as Martha, whose secret (physical and sexual abuse at the hands of her father) is conveyed in the song “The Dark I Know Well,” a duet between her and Ilse that in this production is sung by Rodriguez and signed by Edmond. Rodriguez gives a moving performance, especially in the second act, though I think she and Arden miss the boat with her character, whom Wedekind wrote as a tragic waif whose bravado is a cover for her sense of desperation and impending doom. 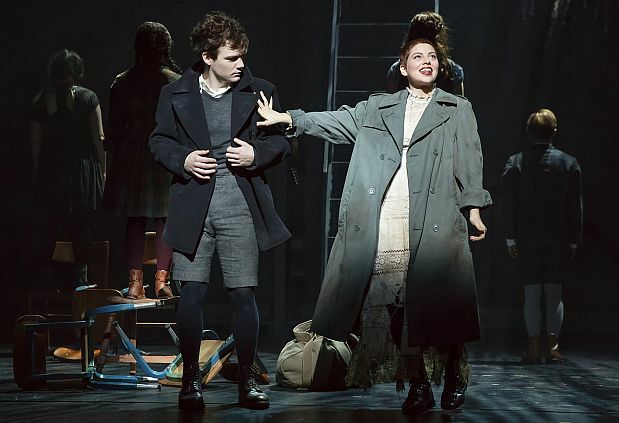 At its best – especially in the “Totally Fucked” number in act two – this Spring Awakening has some of the rocking-out energy of American Idiot, though without the accompanying bitterness and cynicism. Not all of Arden’s ideas work out (I’m not sure why the actors begin and end the show in their underwear), but most do, and the commitment of the young performers compensates easily for the ones that don’t. At the end of the evening a door opens upstage to reveal a forest and the teenagers disappear into it like the children abandoning Hamelin to follow the Pied Piper. It’s a hippie-fantasy finale, and its sweetness follows you out into the street after the final curtain.